Rosa Carhuallanqui's Peruincafolk at the 2008 Faison Firehouse Street Fair. Traditional folk dance from the South American country of Peru uses colorful costumes in traditional fabrics from the Andean highlands and the coasts. Many of the costumes and dances are based on the plants, animals, and lifestyle in the tropical forests of Peru. Dances include the Jungle Dance, from the Amazon region. Like its geography, its cuisine and its various ethnicities, Peruvian music and dance is very diverse. Much of Peru's music is derived from Andean, Andalusian Spanish and African roots. Modern Peruvian music and Amazon-influenced music is also common in Peru. A cajón (pronounced /ka'xon/) (plural: Cajones; not cajons) (Spanish for 'crate', 'drawer', or 'box') is a kind of box drum played by slapping the front face (generally thin plywood) with the hands. The cajón is the most widely used Afro-Peruvian musical instrument in the 20th century and was most likely developed in coastal Peru during the early 1800s. Slaves of West and Central African origin who lived in Peru are considered to be the source of the cajón drum, though the instrument is common in musical performance throughout the Americas, especially Cuba. In Cuba, the cajón is associated with the Afro-Cuban drum/song/dance style known as rumba, while in Peru it is associated with several Afro-Peruvian genres. The instrument reached a peak in popularity in 1850, and by the end of the 19th century cajón players were experimenting with the design of the instrument by bending some of the planks in the cajón's body to alter the instrument's patterns of sound vibration. 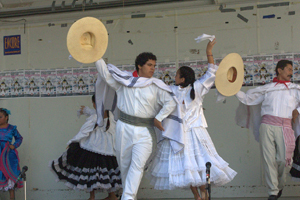 One early use of the Peruvian cajón was to accompany Tondero and Zamacueca (old version of Marinera) dances. In contemporary times, the instrument became an integral part of Peruvian music and Cuban music.